Seattle cornerback Richard Sherman climbs into the crowd to celebrate at the end of the NFC championship game at CenturyLink Field in Seattle on Sunday. All eyes will be on Denver Broncos quarterback Peyton Manning in this year’s Super Bowl, but all ears are pricking up to hear the Seattle Seahawks’ cocky cornerback, Richard Sherman. The third-year defensive star has grabbed the spotlight for Feb. 2’s big game — and that has to do with his noisy talk as much as his outstanding play. Sherman made a game-clinching move in the final seconds of Seattle's win over the San Francisco 49ers on Sunday, then dove headfirst into a trash-talk tirade in front of a national TV audience moments later. “Who was talking about you?” Andrews asked. “Crabtree. Don’t open your mouth about the best or I’m going to shut it for you real quick,” Sherman piled on. The rant was enough to make a pro wrestler blush and it sparked a wildfire on social media, much of it critical of the Seahawks star. Last season, Sherman — himself a prolific tweeter — posted a picture of himself taunting New England Patriots quarterback Tom Brady after a Seahawks come-from-behind victory. Mike Florio, editor of ProFootballtalk.com and contributor to NBC Sports, said Sherman doesn’t benefit from having a “bad habit” of being verbally aggressive. Kostya Kennedy, assistant managing editor of Sports Illustrated, said that while Sherman’s trash talk might turn off some, his latest antics after Sunday’s game did help raise his profile. “Richard Sherman likes to crow, and if you’re not going to crow now when your team is going to the Super Bowl, then when?” Kennedy said. A Sports Illustrated profile last July highlighted Sherman’s blustery behavior. He was described as a “dreadlocked motormouth” prone to rapping freestyle in the locker room and dancing on the sidelines. But Sherman, the son of a garbage man and mother who works with disabled children, is no slacker. He graduated second in his class at Compton’s Manuel Dominguez High School, where he played football and ran track, said the school’s football coach Keith Donerson. “He only received one B, and that was in health class,” Donerson told NBC News. Sherman received a football scholarship to Stanford and switched from wide receiver to cornerback after an injury. He graduated from the school in 2010 with a communications degree, earning a mention in the Los Angeles Times. “He has shown what can happen when you combine athletic and academic excellence,” the Times wrote. 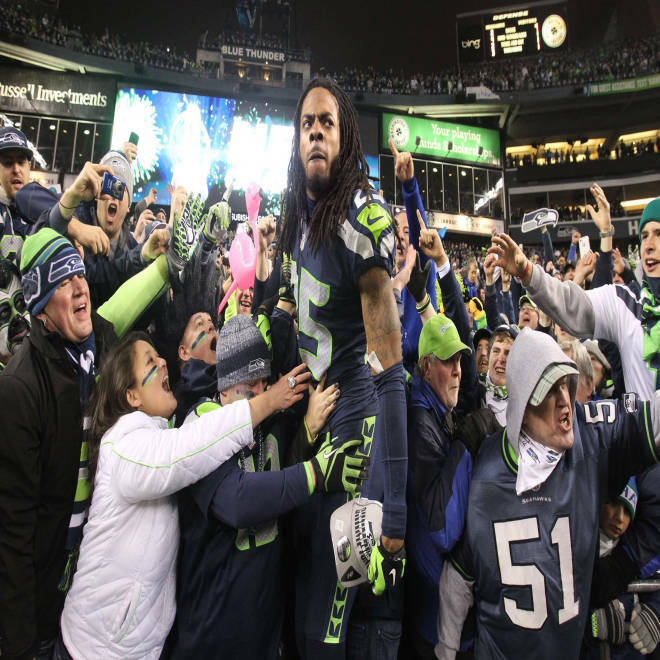 The following year, Sherman entered the NFL draft and the Seahawks scooped him up in the fifth round. The fact that he was called 154th as players he perceived to be inferior were chosen ahead of him remains a bitter point, he’s publicly said. This past season, Sherman stopped by his old high school a couple of times, once donating 30 helmets and answering students’ questions, Donerson said. Sherman wrote Monday that his actions on the field should not be all by which he's measured. "To those who would call me a thug or worse because I show passion on a football field — don’t judge a person’s character by what they do between the lines. Judge a man by what he does off the field, what he does for his community, what he does for his family." As for his shenanigans, Sherman has people watching and listening. Over a five-hour span Monday, he added some 117,000 followers on Twitter.